The global cybersecurity landscape has been evolving over the past recent years and is set to experience significant change and an increase in threats this year. This is extremely evident in the business sector, wherein hacking and data breaches have become more prevalent and more damaging. In fact, recent research from Ponemon Institute revealed that 7 out of 10 organizations say their security risk increased significantly in 2017. Considering 2017 was the year that brought us the worst ransomware outbreak of all time – the WannaCry Ransomware – and the Equifax data breach that exposed the personal information of almost half of the U.S. population, it is no surprise that most business organizations say they are facing more cybersecurity threats these days. One of the most significant trends in the past year that is also expected to continue in 2018 is the shift of attacks from using malicious files to “file-less” techniques. Not only this presents a challenge in the way attacks are detected, but it also poses a severe problem in the way business implement security solutions. 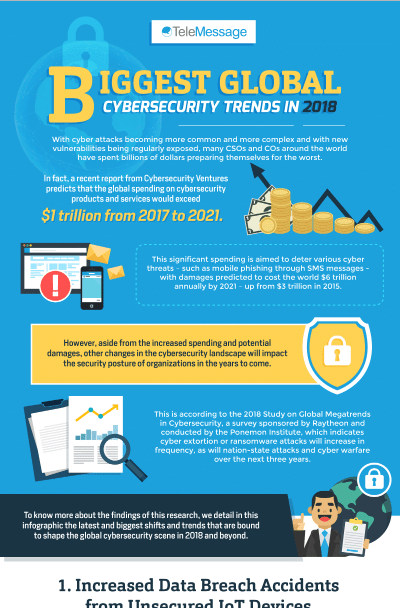 If you want to learn more about the biggest trends in cybersecurity landscape in 2018 check out this infographic from TeleMessage.